Most people’s first encounter with an possum isn’t necessarily pleasant. Possums are unlike the typical insect pests, and can cause significant anxiety among their hosts. These resilient and versatile little critters can cause plenty of concerns. These guys love to hang out in attics, underneath houses, garage, or virtually any crawl-space. Possums are more common in suburban areas. The following guide is set up to help you take care of your possum problem for good. While it is technically possible for any mammal to get rabies, it’s extremely rare for a possum to have rabies. This is largely due to the possum’s low body temperature, which makes it difficult for the rabies virus to survive. This doesn’t mean getting bit by a possum is necessarily a positive experience, and if you are bitten you should still consult medical attention. Thankfully, possums are usually very docile and will not be aggressive unless provoked. But in certain situations possums are known to lash out in self-defence such as when aggravated by a protective or overly playful cat or dog. This is when possums can cause significant harm to our pets. These animals have some unique qualities that are important to note for the purpose of pest removal. They are marsupials, which means they are capable of holding up to 13 little possums in their belly at a time. If one possum is left unperturbed, it could potentially turn to 14 within a few weeks. Possums are omnivorous and will make a meal out of nearly anything. This means any old garbage or decaying old meals are fair game to keep these guys around. Additionally, possums are notorious for playing dead, or “playing possum”. If you are hearing little foot steps and clawing in your attic, garage, shed, or crawl space underneath your house, chances are you’ve got some sort of animal that’s made it it’s home. No matter what type of critter it is, this preventative measure works for all. Low decks are especially susceptible to be breached by possums if not adequately sealed. Thoroughly inspect your home to identify any possible entry points and close them off to prevent any re-entry. While you may be excellent company to hang around with, possums are likely only after your food and garbage. Getting rid of any potential food sources won’t give them a reason to hang around your backyard. If they’ve found comfort in your home, however, they are likely searching for food elsewhere and relying on your home or shed for a dwelling. Since possums are fairly slow, they are very easy to trap in a cage. One must be wary of their tendency to get aggressive when cornered (like any animal), and it’s best to leave this to a professional who can humanely capture and transport the possums. This is one of the most basic pest control tips out there because it works. The vast majority of possums are incredibly aversive to human interaction, so if you see one of them waddling around your backyard, simply making your presence known and warding them off with a stick is enough to get rid of them. If they’ve settled in your home, however, that’s a different story. 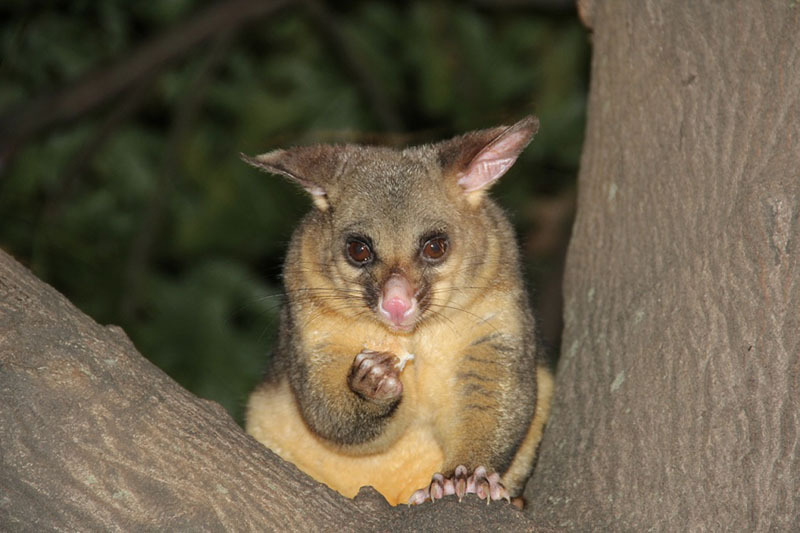 The one-off possum problem every now and then can become very frustrating since if possums are left undisturbed, they may take a kindness to your property and start hanging out more. Outdoor possum problems can be largely handled by removing and garbage and potential food sources, but the indoor ones will require some extra effort. Make the call to a pest control expert to get rid of your possums so you can start taking and executing preventative measures. A protective pup is enough to keep most intruders far away, but it’s important to give it adequate training. Waking up to a dead and mangled possum courtesy of Fido every other week isn’t a pleasant experience, and pest control is all about removing as much friction and as many annoyances as possible. If you’re considering going about this problem the same way you would with insects, you might be a bit disappointed. Repellant products have very little effect on possums, and the amount you’d have to use on them could cause negative effects on yourself and your own pets. Having a pest control member on your team can be an invaluable asset in terms of reducing your stress from all pest problems. Scheduling regular and scheduled visits with a pest control expert not only eliminates the actual pest problems, but it gets rid of the stress from having to deal with pest problems in the future. The less cover possums have to hide, the less inviting your backyard looks. Keeping your grass cut short, bushes trimmed tight, and tree branches trimmed away from your roof are great steps to take to secure your backyard and home from possum invaders. Having some motion-activated flood lights or sprinklers are an excellent second line of defence for keeping possums away. The lights might do a decent job at scaring off skittish critters, or at the very least illuminating your yard and making you aware of them. Sprinklers, on the other hand, are much more effective. The first sight of a possum might be unsettling, but keep in mind that these are just one of the many critters scurrying around the world. Some of them just so happen to find your property enticing, and doing so puts your peace of mind at stake. Taking adequate preventative measures to make sure you don’t receive any more unwelcome possum visits, paired with regular pest control, is the best long-term strategy to keep your home free from pests and critters.